How did you get your internship? I received my internship through FIU’s Agroecology Program as part of the requirements for the certificate. I had to complete 160 hours at an internship of my choice. I was unaware of any internships at the time, so my advisor and Agroecology Program Manager Eric Betancourt helped me find one close to home. What did you do there? What projects did you work on? My experience involved going out into the field to collect fruit to be analyzed and return to the lab to record phenotypic data on the fruit collected. I recorded that information onto a tablet which was uploaded into a database. The types of fruit we worked on included mango, sapodilla, lychee, jaboticaba, tamarind, and white sapote. What was the coolest thing about your internship or that happened during your internship? 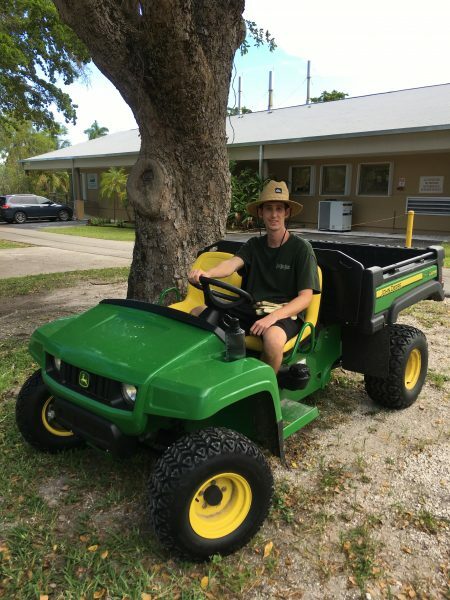 The coolest thing was riding around on the John Deere four wheelers to go out into the field and collect fruit. Driving through the many trees and different orchards was fun and made me feel free as a bird while still working. What advice do you have for those beginning the internship process? Don’t be afraid to continue the process. There’s a lot of technical academic terminology that scared me at first and made me hesitant to start, but I’m very glad I did it. By the end of it all, it was much easier than I expected. I was able to get a temporary job after my internship at the same facility. What did you like most about your experience? The people I got the chance to work with. Everyone was very helpful and knowledgeable about the plants we worked on and the history of the facility. It was very easy to get along with everyone there. What did you learn about yourself? I learned that after many years of wondering what career path would best suit my interest, I’m certain that this was the right choice. I couldn’t see myself being happy in any other field of work. How did the position increase your professional confidence? The position enabled me to work alongside scientists in the lab and socialize with them at lunch. I feel as though I’m able to adequately meet the level of professionalism set out by a government facility. I feel confident in my ability to work alongside other professionals with new experiments to help discover scientific break-throughs.